The USSC90 needed a collator. In a modern database all types of data about the objects are linked together. Data in punchcards is just a stack of cards, without links or aggregation. 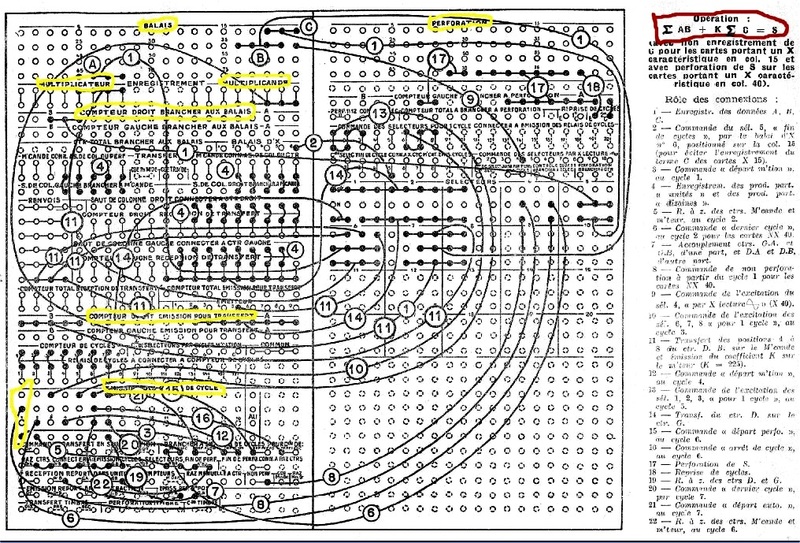 90 Column punch-cards could contain only 90 characters of alpha-numeric data. obliged the operators to duplicate regularly the card-files, so there was much redundancy. or to merge two stacks, so two types of data would be placed in groups. Card-stacks had to be merged, split or sorted in special orders to obtain data-stacks that could be processed. Each program-run needed its data-cards in a specific order, sorted or merged together. In a big company, the work on the USSC90 was scheduled precisely. and processing by the USSC had to be performed in a strict order. One of the machines to process the data-files, was the collator. it was meant  to merge or to split two stacks of punched-cards. The collator could read cards from two input-bins and it could memorize and compare the data. selected one of the three output-bins in which the card was deposited. The logic-circuits of this machine consisted exclusively of relays, however it worked reliable. Design-sheet for the programmingboard of the collator. when both were sorted on employee-number. The result-file then could be processed by the USSC to calculate monthly payments. The collator was programmed by a plug-wired board with 2500 holes. There were several program-boards so they could be replaced easily to perform different tasks. and it performed simple tasks for which the use of the USSC was too expensive. and the stack of data-cards was entered into the second bin. which printed the contents of the punchcards on two lines on top of the data-rows of that punchcard. It was driven by an electric motor and it worked completely mechanically. prevented that the operators had to read the RR-code from the punched holes, when manipulating the cards. The sorter divided a pile of cards into 14 bins, depending on the content of one column. A small program-board and a wheel to choose this column, allowed an operator to choose a sorting-criterium. for instance from an employee-number-order to an employee-name-order. Sorting cards to an alfabetical sequence of a 12 character name had to be performed in 24 steps. A sort was started on the most right-sided column of a name by sorting it on A-M into 14 bins. the bins 2 till 14 were meant in the first sort for A to M and in the second sort to lay down cards containing N to Z. The operator collected the cards out of the bins in such way that the A-cards came at the bottom. Then the cards of the first bin were sorted on N-Z, collected and put on top of the first result. This was repeated for each column of the field from the back to the front untill the first column of the name or the field was done. operators often had to perform sorts in between running programs. Altough the sorter was called: Electronic Sorter,  the only electronic device was the light-cell-amplifier. which was set and was read by electro mechanical switches. The speed of sorting cards was rather high, about 900 cards per minute.